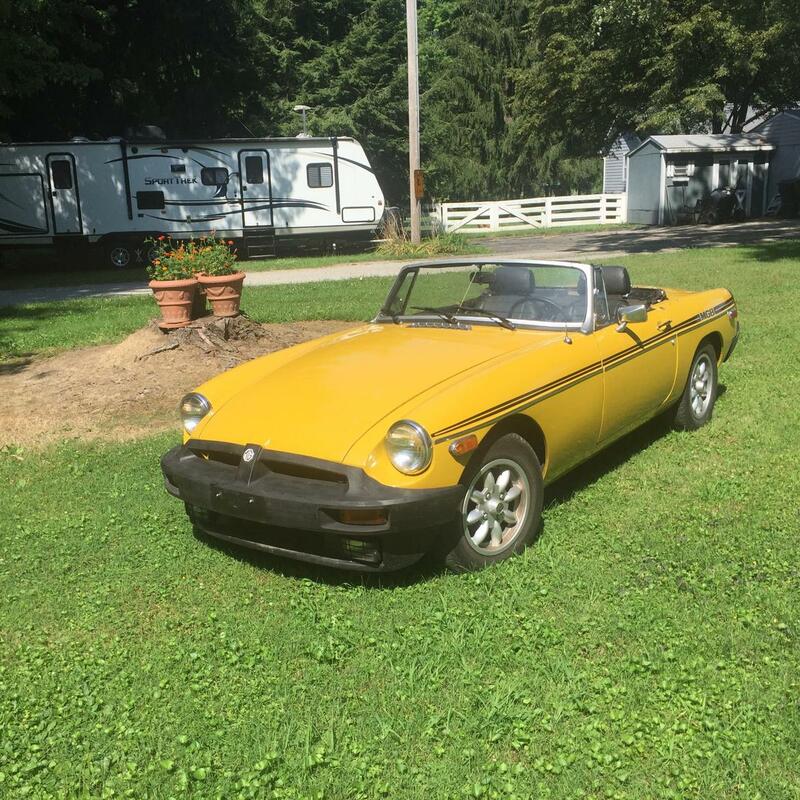 1979 MGB powered by a Rover 3.5 liter all-aluminum V-8. - I'm selling off a few of the cars and motorcycles that I don't get to use very much and this is the second one to get advertised. It's a very nice car, please take a look at the pictures in the link. MGB's are seeing a very steady increase in popularity and value over the last few years. 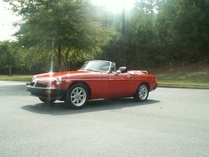 - I've owned several MGB's over the years, all of them with the stock 4-cylinder engine. This car is SO much more enjoyable to drive with the added power of the V-8. Lots of torque and an intoxicating exhaust note make it a true joy to cruise in. It's not a race car, just a fun and quick weekend cruiser that will surprise you when you step on the gas. - From what paperwork I have, the conversion was done in at least 2006. The gentleman that I bough the car from purchased it in 2011. A copy of the title shows that the person he purchased it from titled it in his name in 2006. - the engine is the ROVER 3.5 liter all aluminum British "lump" that was known here in the states as the BOP(Buick/Olds/Pontiac) 215. The same unit used in the Triumph TR-8 and MGB GT V-8. It's not a huge powerhouse of a motor, but more than doubles the horsepower from stock. 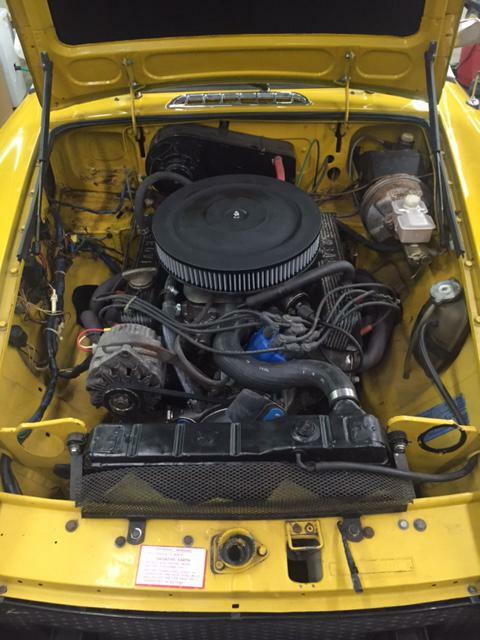 The original B motor made 70 horsepower +/- in 1979 and the car now has 160hp and you can really feel it! - It breathes thru an Edelbrock 500cfm carb and exhaust thru a new "true dual" exhaust. From tubular fenderwell conversion headers to 2" collectors, then FlowMaster Series 40 mufflers and finally out dual stainless tips. Looks nice and has a very nice exhaust note. Not what you would expect from this car, but turns many heads when driving by! 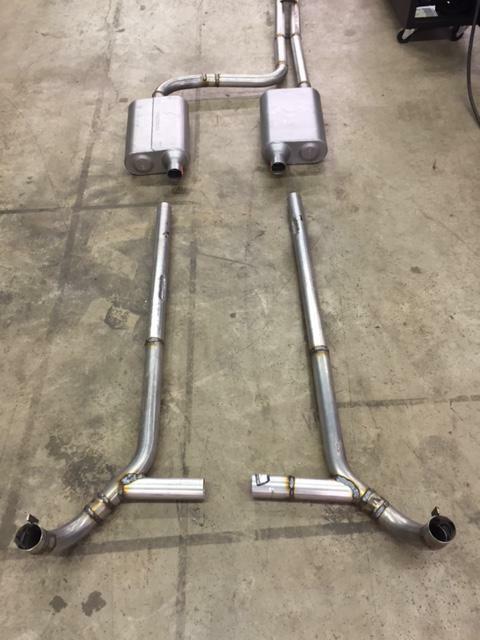 The exhaust system was installed last year as soon as I bought the car. 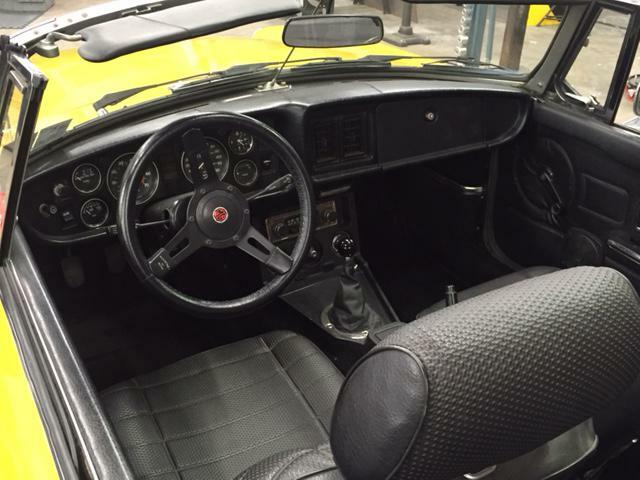 - The transmission is the stock MGB 4-speed and mounts to the motor with a conversion plate. - The rear is a Ford 8" unit sourced from a Mustang II and has a 3.00:1 ratio. Feels just right with this gearing, not a rocket but a very nice compromise between city and highway cruising. There was also a rear tube shock conversion done at some point. - Wheels are what people like to call "Minilite replicas", but these are actually made by Minatour. They are 14x6 and shod with 165R14 tires. They look GREAT on this car. - No rust in the trunk, floors, rails, jack points, etc... Of all the MGB's that I've owned over the years, this is by far the nicest uni-body that I've had. - Good paint but it has been repainted above the chrome trim and it is a shade "off" of the lower portion of the car. I notice it, but I'm very critical and writing this description so that there is full disclosure of the cars current condition. If you go far enough and read the MG Experience thread, you will see why I want full disclosure. - Radiator was just "hot tanked" and had a small hole repaired. Car is equipped with a water pump mounted flex fan and also retains the 2 stock electric fans mounted in front of the radiator and are controlled by a dash mounted switch. Runs fine with no over heating. - I've also added a 14" Mountney steering wheel, a Longacre billet shift knob, boot cover, new headlight switch, K&N air filter and probably a few more little things that I can't recall at the moment. - A new carpet kit is included, but not really needed. A friend found out that I bought this car and he had it left over from a previous project and figured I would get some use out of it, so gave it to me. Also included are a set of Amco rubber floor mats. Titled in my name and the car is inspected/registered in PA. The car is located in northeast PA(Exeter zip 18643 or Dallas zip 18612). Thanks for looking and feel free to reply with any and all question or additional photo requests. If you would like to discuss the car rather than typing, forward me a phone number and a good time to call. The 3.5 Rover V8 was not original to the Stag. No one would want it if that is indeed what is in your MG. The Rover V8 is a popular transplant for the Stag V8 which is basically two TR7 motors. Gotcha, good to know. Original post edited and info burned into my brain moving forward. I must have seen a bunch of converted cars over the years. Nobody looking for a fun weekend top-down toy? Would consider an NB/NC "Answer" as a partial trade plus cash. A man here in alpharetta Ga. has an MGB with the 215 Buick and I think it has the rover heads and he regularly drives it to Colorado and the west coast and I mean Major Miles get racked up it's a good engine swap. Lowered the price to my bottom line, $8900. I also have a complete new carpet kit that will be included in the sale. Nobody looking for a fun summer toy? isn't the buick 215 the base for all rover motors? A good bit of reading for those interested in the history of this motor. Still here but needs to find a new home along with the Miata V-8 and Rotus. And I believe the Stag was supposed to get the Rover engine, but politics made them use the Triumph engine. Too bad. How hard is it to back-date them? It seems like they have the same body panels. 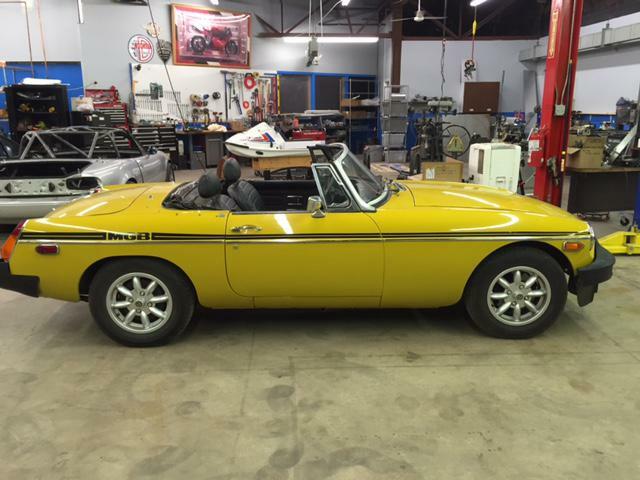 Just about every supplier of aftermarket parts for MGB’s sells a conversion from RB to chrome bumper for this car. Before doing a chrome bumper conversion, I would consider doing a Sebring front valence and bumper delete. Maybe some sort of flares too, but that’s getting way off the beaten path for a car this nice. Price reduced to $8900. I’ve had a few “tire kickers” and gave a few test rides, but nobody has pulled the trigger yet. Anybody? It’s still sitting here in the nice warm shop. Going thru my “to-do list” as time allows. - Replaced trans and diff fluids. - New fluid in front shocks. - Replaced front coil springs. - Replaced front sway bar bushings. - Replaced lower a-arm bushings. - Replaced upper trunion bushings and boots. - New cap, rotor, plugs and plug wires. I sold the V-8 Miata and this one needs to go next. Top-down time will be here shortly. Speaking of convertible tops, I have a brand-new in the box top that goes with the car. I will be installing it once the weather warms up. Anyone looking for a new toy?